For over 60 years, Tanita has been the world leader in precision scales. Tanita's performance, innovation and durability are trusted worldwide. Introducing the next generation in digital beam scales. 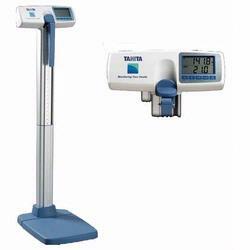 The WB-3000 features an automatic BMI calculation and RS-232 and USB outputs to capture patient data. The mechanical height rod allows patients height to be taken the same time as weight. The WB-3000 is the perfect all-purpose weighing system combined with classic design and modern efficiency. Manufactured to Tanita's stringent quality standards, the WB-3000 represents a true professional grade scale for years of uninterrupted operation. Platform Dimensions: 15.7" x 15.2" x 2.0"
Tanita introduces the next breakthrough in stadiometers, with its brand new wall-mountable height rod, the HR200. From its high-quality aluminum construction, to its durable ABS plastic, this easy-to-mount height rod is simple-to-use and built for many years of service. Mounting is effortless and can be done within minutes - just place the pillar on the floor, positioned against the desired wall, and install with the included hardware. The HR200?s innovative modular design allows for years of serviceability, should it ever be required. Plus the retractable design and folding headpiece stores in a compact footprint when not in use. This easy-to-read height rod measures from 25" to 84" (64 cm to 214 cm). Tanita has long been the professional's choice for medical height measurements, due to our long-trusted accuracy and reliability. New Design! This easy-to-mount height rod is simple-to-use and built for many years of use. Plus, the retractable design and folding headpiece stores in a compact footprint when not in use.